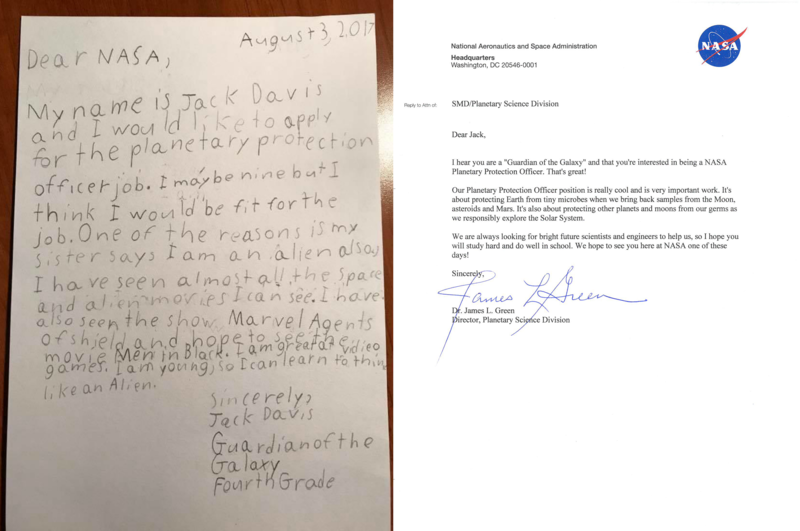 A 9 year old boy recently got a reply from NASA after applying for the job of planetary protection officer. Describing himself as the “Guardian of the Galaxy” and having a sister who thinks that he is an alien, the fourth grader stated that he might be fit for the job. He also stated that he watched movies like Men In Black and Marvel Agents of Shield and that he can learn to actually think like an alien. Dr. James L Green replied to the 9 year old, saying that they are excited about him wanting to apply for the job. The letter contained very encouraging words to push the fourth grader into a successful scientific career. Kids these days huh? Leave your opinions on this in the comment section.